Construction is more than one of the world’s most dynamic, exciting, rewarding and challenging industries (even if we are biased.) It’s a highly collaborative discipline that invites practitioners to elevate their skillset throughout their careers. Recently the MCA Leadership Training Academy (LTA), hosted by the Minnesota Construction Association (MCA) and its student outreach initiative, Construct*ium, drew record attendance with a packed agenda of engaging activities, all reflecting the nonprofit MCA’s mission of fostering education, recognition, and networking. The event was held at Graduate Minneapolis, on the edge of the University of Minnesota Twin Cities campus. This year’s event offered two tracks of activity. The MCA Leadership Training Academy offered panel discussions and key note speakers designed for the industry professionals in attendance. The second track, a pentathlon, featured construction management students competing in various academic and leadership events connected to the industry. Several KA employees contributed to the success of the event, including Chad Rettke, construction executive with Kraus-Anderson and former MCA Board President; and Ryan Klick, Kraus-Anderson project manager. Q: Attendance this year was the best ever! Who was there? CHAD RETTKE: Attendees included seasoned panelists from our construction industry; professionals from many different construction industry disciplines, including designers, general contractors, sub-contractors, insurance providers, legal professionals, and many more. We also had students from our 10 student members’ colleges and universities in attendance. 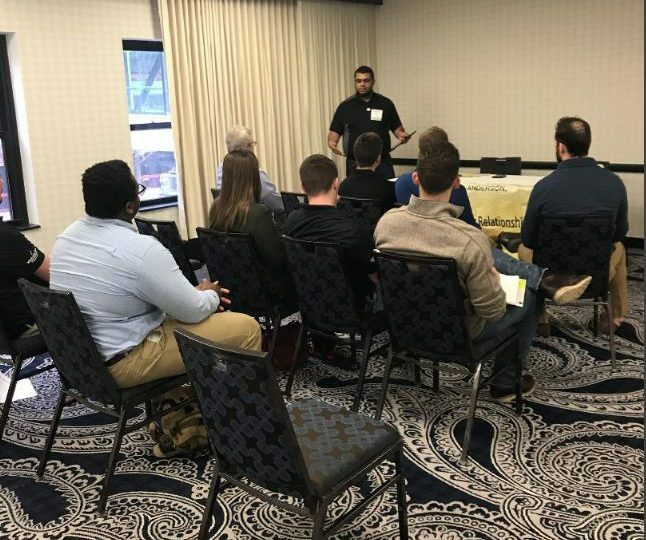 In addition, the event was held in conjunction with the 54th annual Associated Schools of Construction (ASC) conference, so we were joined by construction management college faculty from around the country. Q: To what do you attribute the event’s success? CHAD RETTKE: I believe that our group truly understands the benefits of collaboration in our industry and the fact that when we work together, we can accomplish so much more. This event is a reflection of that. Plus it helps to have a whole bunch of hard working volunteers that are passionate about growing our industry. Al Gerhardt, left, spoke at the LTA’s Construction Industry Executives panel. 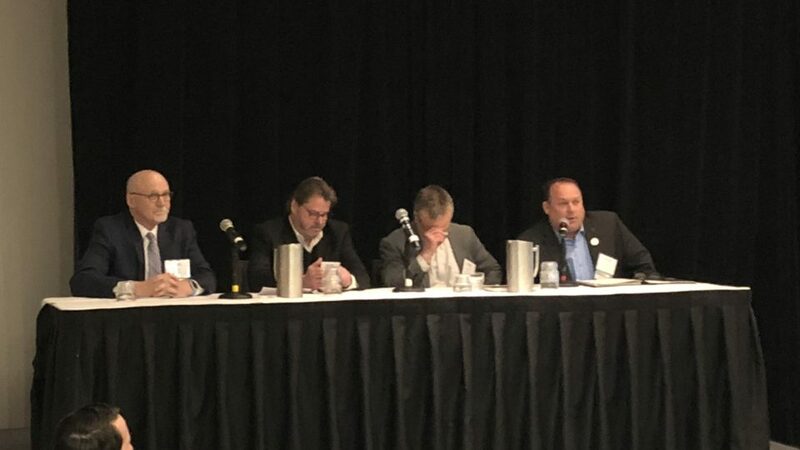 Q: Kraus-Anderson Construction Company President and COO Al Gerhardt participated on the Construction Industry Execs panel on paths to success in the construction industry. What were the highlights? CHAD RETTKE: It was great to have several high level executives to talk about what got them where they are today, and what others should be thinking about to grow into the next generation of leadership within their organizations. Q: Talk about the pentathlon competitions. Who participated, and what were the topics? CHAD RETTKE: Construct*ium presented five competitions for students from MCA’s 10 member colleges and universities: Dunwoody, Iowa State, Minnesota State University Mankato, Minnesota State University Moorhead, North Dakota State University, South Dakota State University, University of Minnesota, University of Northern Iowa, St. Cloud State University and University of Wisconsin-Stout. The competitions included Job Interviewing, Toastmaster public speaking, The Pursuit (a team challenge to create and present a complete proposal); Pecha Kucha http://www.pechakucha.org/, and Negotiation skills. Q: A very popular feature was the Leadership Kiosks. Talk about how those came together. What were the takeaways/highlights for you? RYAN KLICK: Early in the planning process we identified a lot of down time between competitions for the students, and wanted to provide additional learning opportunities, and thus the Leadership Kiosk was born. The idea was to give a more informal conversational learning opportunity for students and young professionals. We wanted to put younger Kraus-Anderson leaders in front of the students to provide them with the insights they have gained as they transitioned from students to professionals. Josh Carr presented at the LTA’s Leadership Kiosk. When the opportunity for us to present the leadership kiosk came about, I approached KA Director of Professional Development Mike Smoczyk, and he introduced me to the Kraus-Anderson Emerging Professionals group. From this group we enlisted Josh Carr, Sam Larson, Nathan Theisen, Alex Titterud, and Kent Henry to lead the kiosk presentations. Each selected a leadership topic and prepared a 15 minute presentation. The goal of the topic selection was to provide a learning opportunity on a topic that is not typically taught in class. The topics presented were Working with Difficult People, Ethics, Customer Service, and Networking. Q: Overall highlights/ takeaways of the event? RYAN KLICK: The highlight of the day for me was being able to see all of our hard work come together. The MCA mission is to foster education, recognition, and networking of all industry professionals who collaborate to plan, create, and sustain best construction practices. This event really exemplified that mission by providing educational and networking opportunities for industry wide professionals and students. I think events like this help create a larger construction community that transcends company lines and roles in the construction process. CHAD RETTKE: All in all, I would say that this event truly embodies the mission of our organization. Good morning, I am interested in your leadership development and emerging professionals program. Can you let me know the details as I have a few folks that I think could benefit.